Home / Shop / For The Classroom / Manipulatives / Operations & Algebra / Cuisenaire Rods Introductory Set: Plastic Rods – While supplies last! 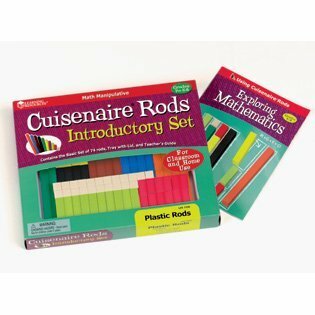 Cuisenaire Rods Introductory Set: Plastic Rods – While supplies last! Rods come in various lengths that can be assigned different numeric values or units of measure. Introductory Set of plastic rods contains 74 rods, tray with lid and Activity Guide. Set includes 22 white, 12 red, 10 light green, six purple, and four each of the yellow, dark green, black, brown, blue and orange rods. Use with 2–3 students.